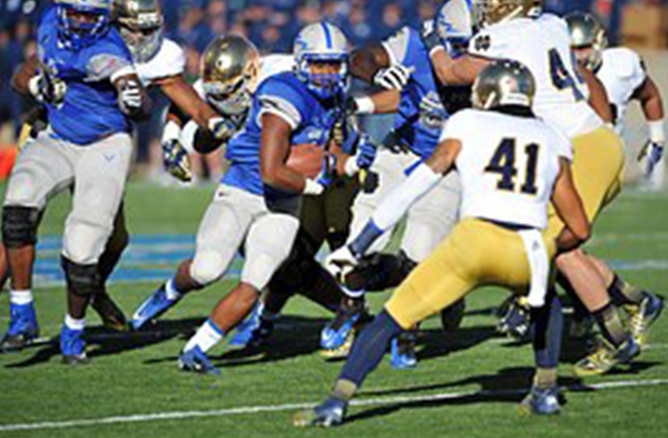 The draft of football players considers athletic performance as one component. Aspiring athletes from high school and colleges can participate in a ‘combine’ to demonstrate various aspects of their capabilities. For example, the SPARQ score is a single number measure that combines the outcome of weight in pounds, 40-yard dash time in seconds, shuttle run time in seconds, vertical jump in inches and powerball toss distance in feet. This provides a score number for each person, the higher the number the better. It communicates athletic prowess to scouts and also a yardstick for individual training progress. The uSPARQ for Football project was initiated to address the uncertainty of the SPARQ score. First there is the variation in the individual on the day of the test. For example if the individual has repeated tests, are they consistent? Second, there is the chance that the individual is having a ‘good’ or ‘bad’ day on an event or overall. Testing a person on a different day or week could yield a different score. This is difficult to determine but should be considered. The variation of performance might be a sign of inconsistency that might translate to poor performances on the field. In a team sport, every person must do their job consistently and this has to do with uncertainty. The CertainError project started with the determination of the existing and unpublished SPARQ score formula. This is done by collecting performance data for a wide variety of people along with their published SPARQ scores. Then the data are transformed and fitted with a multivariable function. The uncertainty of each measure is estimated or collected from individual data or by relative estimates. This allows the conversion of every performance number to the duals format. The solved SPARQ formula is converted to duals arithmetic. The uSPARQ score is the SPARQ score reported with its uncertainty. The uncertainty is now another number that can be used to make decisions. Lower uncertainty is a good thing and makes the SPARQ score more reliable measure.